The New York City Department of Environmental Protection (DEP) today announced the creation of two new day-use areas in the watershed, providing local residents and visitors with additional locations for enjoying the outdoors and local history. Both day-use areas are located near Pepacton Reservoir in Delaware County. They include the site of a former bridge in Dunraven and Pepacton Cemetery in Andes. The Dunraven Day-Use Area is a 2-acre site on the East Branch Delaware River, at the head of Pepacton Reservoir. The park comprises two small areas of land on either side of the river, including the former abutments of a bridge that was located there during construction of the reservoir. One side of the park is accessible from Route 28, and the other side is located on BWS Road 10. This unique area is good for fishing in spring when the river is high. It is also good for picnicking, reading a book, eagle watching or enjoying scenic views of the valley year-round. The Pepacton Cemetery Day-Use Area includes 54 acres on a hillside that overlooks the reservoir. Last year, DEP and local experts finished a full-scale restoration of the cemetery, which is the final resting place for more than 400 deceased who were removed from local burial grounds and reinterred to allow for the construction of Pepacton and Cannonsville reservoirs. The city-owned cemetery was rededicated in their memory last November. The cemetery is a significant site for local history. Those buried at the site include the founding families of towns in Delaware County, along with more than 25 veterans of the Revolutionary War, the War of 1812, the Civil War, and the Spanish-American War. The cemetery comprises approximately one-quarter of the day-use area, while the remainder includes a field with excellent views of the reservoir. That field is now open to the public for picnicking, walking and other low-impact activities. With the addition of these two sites in Delaware County, DEP has now designated six day-use areas on water supply lands. Day-use areas are parklike settings that can be used by the public for a variety of low-impact activities without the need for a DEP Access Permit. 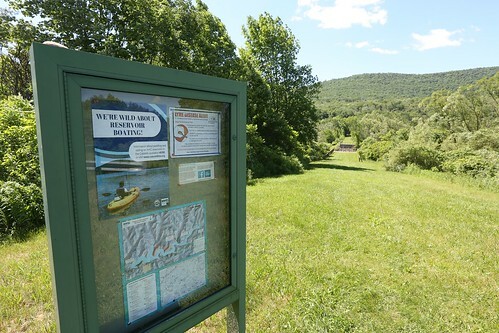 DEP’s other day-use areas include public walkways at Ashokan, Cross River and Kensico reservoirs, and the 53-acre Devasego Park in Greene County, which includes a boat launch and picnic areas. More information about these areas can be found by visiting DEP’s website at nyc.gov/dep/recreation.